Webster University Thailand held a Career and Internship Fair at Empire Tower in Bangkok on Nov. 30. 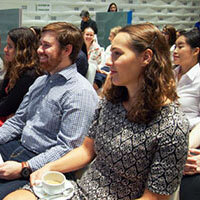 The event attracted numerous students, both graduate and undergraduate, from across a number of different disciplines. Students had an opportunity to interact with Thailand's leading companies for both internships and management trainee programs.